What Will Thomas Tyner Have to Bring to the Table in 2015? The Ducks will have a backfield that is loaded with talent for the upcoming 2015 season. Along with Thomas Tyner, the Ducks will have Byron Marshall, Royce Freeman, and the 5-star freshman Taj Griffin taking handoffs from the backfield. 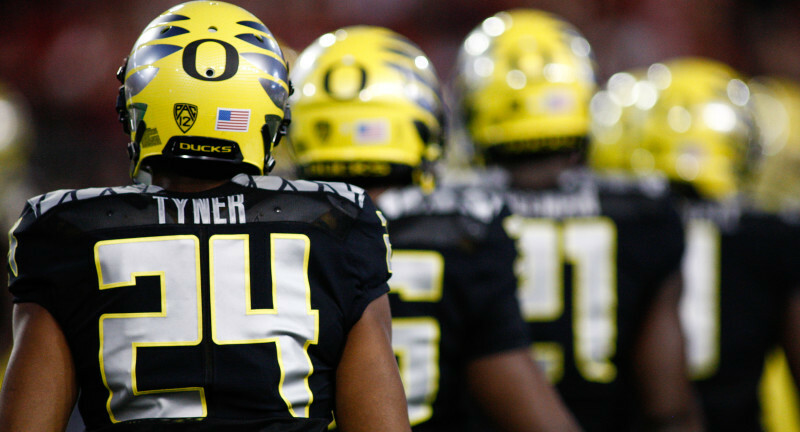 Throughout the 2014 season the Ducks ran a two-back system, giving both Tyner and Freeman touches. Marshall also got a few touches as a motion man. However, the question for the upcoming season is, “Who will get the majority of handoffs?” Freeman started to carry the load late into Oregon’s 2014 campaign, but Tyner has a very good chance to be a productive back for the Ducks in 2015, as well. 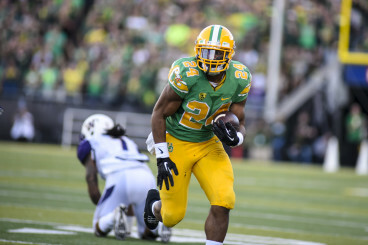 Thomas Tyner carries the ball against the Huskies. Tyner ran the ball 113 times last season, piling up 573 total yards while averaging 5.1 per carry. However, Tyner put up slightly better stats in his freshman year during the 2013 season. He ended 2013 with 115 carries with 711 total yards while averaging 6.2 yards per carry. With the mounting competition arising in the backfield for the Ducks, Tyner will have to prove himself during practice and the spring game in order to be one of the two main backs in the rotation for the Ducks’ offense. The 5-foot-11, 215 lb. junior will have to increase his skill set during the offseason so he can become a versatile back for the Ducks, similar to Marshall’s style of play last year. It will be an interesting battle for the starting position during the next few months between Freeman, Tyner and Griffin as they will all show off their newly acquired skills throughout the spring. Expect Tyner to emerge in the spring game and prove that he will be one of the starting backs for the Ducks next fall.